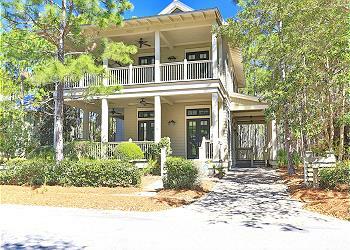 DETAILS: A gorgeous, quiet home on one of the most private lots in all of WaterColor! 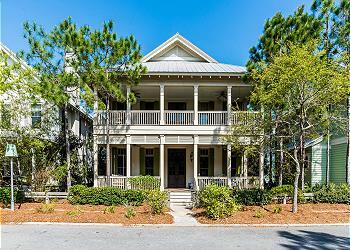 12 Thicket Circle is a newly furnished 4 bedroom, 4½ bathroom home with accommodations for 12 guests. Surrounded on two sides by a nature preserve and featuring a tree-filled buffer between the next-closest home, this property offers guests the ultimate tranquil getaway. The main floor offers an open-concept layout, with the living area, dining space, and well-appointed kitchen in one large space. Natural light fills the first floor through the surrounding transom windows and French doors. The living room features a lovely and plush chaise lounge sofa and two armchairs. The large, mounted flat-screen television can be seen from the nearby dining table, which has seating for six guests. Top-of-the-line stainless steel appliances, white cabinetry, and granite countertops await in the kitchen, and four additional seats are available at the kitchen island breakfast bar. The first floor also offers a queen bed guest room with a large mounted, flat-screen television and private bathroom with shower/tub combo. The second floor offers a variety of sleeping arrangements. The landing area features a twin-over-twin bunk bed and comfortable queen sleeper sofa. Nearby is a queen bed guestroom with a shared bathroom and shower/tub combo. The master bedroom offers a luxurious king bed and a private bathroom with double vanities, a clawfoot soaking tub, and a separate shower. The third bedroom upstairs features a queen bed and private bathroom with shower/tub combo and single vanity. 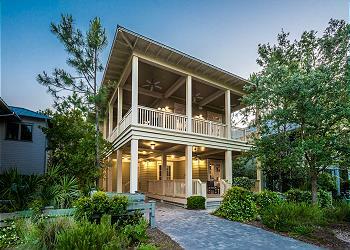 Ample seating is available on both the upper and lower-level porches, including single hammock swings and a bed swing—perfect for enjoying the peaceful sounds of the surrounding nature preserve.